Each fall, as the colors turn and the air becomes more chill and crisp, I’m reminded of my days in my local 4-H club—the Plum Valley Boosters. New members joined the club each fall, when members chose their project or projects for the next year. As I grew older, I took on more 4-H projects. In addition to dairy, I enrolled in macramé (hey, it was the late 1970s, and that craft was all the rage), farm safety, and tractor maintenance. The tractor maintenance projects were designed to add to the basic mechanical knowledge that most farm kids already had and to channel that knowledge into handling even more of the regular maintenance and upkeep of parents’ machinery. I was already doing some basic equipment maintenance for Dad. That included greasing bearings, checking oil levels in the tractors, and changing the oil when needed. Now, with the tractor maintenance books, I took an interest in additional duties such as checking and cleaning air filters and oil filters on each tractor. Each summer, Great-Uncle Raymond Brewer would spend an evening helping me finish my tractor maintenance project for the year. He was a great resource. That task was different for each tractor. On our John Deere 2640 Utility and our John Deere 4240, the air filters were easy to service, because they were paper filters that captured dust before it mixed with the fuel in the engine. All I had to do was remove them from their compartment and tap them gently on the tractor tire to knock out some of the dirt. Then, I’d use a nozzle on our air compressor to blow out even more dirt before reinstalling each filter. On our John Deere 3020, the service was more complicated. There was a dust bowl on the top of the tractor to catch the biggest particles, and its clear plastic design allowed the operator to see when it needed to be removed in order to shake out the dirt. After that initial “filter,” the air was drawn through an oil-bath cleaner to catch the smaller dust particles—and the bowl that filled with that polluted oil was no fun to clean. After removing the bowl from the tractor and dumping the black oil in a pail, I had to use a flat-headed screwdriver to gently scrape the caked-on dirt from the bottom of the bowl. By now, my hands were coated in dirty oil. Then, I’d pour the correct amount of fresh oil into the bowl and carefully reinstall it at the bottom of the oil bath. It was easy to tip and spill oil during this process, and that meant the need to refill to proper levels yet again. While the 2640, 3020, and 4240 burned diesel fuel, for a few years we also had a John Deere 2520 gas tractor. That added a new aspect of tractor maintenance—the gas-fuel filter. That little glass bowl and its components were pretty to look at but easy to get out of alignment. I kept track in a notebook of what I had done on each tractor throughout the project year, and then I transferred that information to the project book, when it was time for the county fair in August. In addition to keeping track of maintenance performed, I had to provide a photo display of my work. When Great-Uncle Raymond needed to consider a complex question raised in the tractor maintenance book, he would need a pipe of Velvet-brand tobacco. Note the ashtray and matches at the ready. The last part of each tractor maintenance book included a number of questions that were supposed to involve basic mechanical properties. While I tried my best to answer them, there were a few stumpers that were based on much older tractors than those we had on our farm at the time. Fortunately, Great-Uncle Raymond Brewer was familiar with those tractors and helped me with those questions. 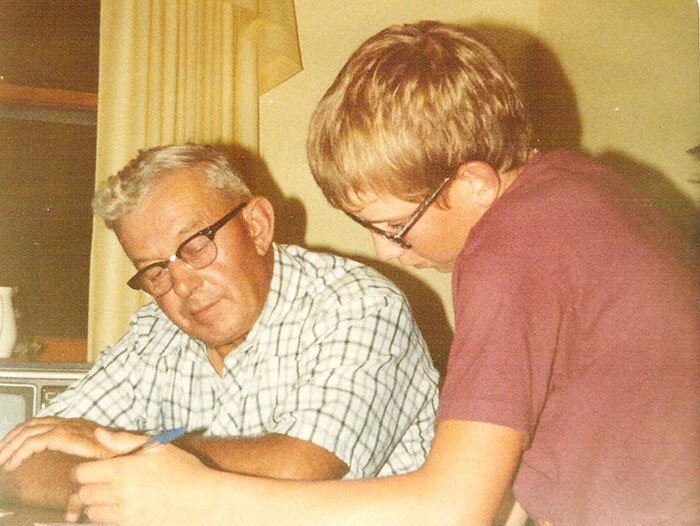 I treasured those evenings spent at our kitchen table, with Uncle Raymond puffing on his pipe and laughing at the questions that were supposed to be designed for an adolescent beginner and were more tailored to a shop mechanic with years of experience. I wish I still had the books so I could share a few here. Those years of tractor maintenance paid off with several blue ribbons at the county fair and even a trip to Madison, Wisconsin, one summer for a 4-H Congress. That expedition included tours of several types of energy-generating plants in the area, including University of Wisconsin-Madison’s small nuclear reactor. Did any of you take a tractor maintenance project in 4-H, FFA, or another farm-related club? Share your memories in the comments below.